Brush strokes are applied to the canvas exactly one-half pixel down and one-half pixel to the right of where the brush cursor is. The same thing happens when stroking a path. This can make it difficult to do detail work. I am zoomed to 1600% here. I had to draw the cursor because printscreen didn't capture it. I have noticed several other small inaccuracies. 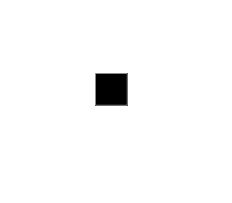 Here I made a black pixel with a 1x1 path around it, then I rotated the image 45 degrees. When viewing an image at less than 100%, there are some alignment issues between layers. I drew two red circles on the background with the pencil, then made a new layer with two white circles. I made a new layer and drew two white circles offset by a couple of pixels, then nudged the layer back over the original red circles. 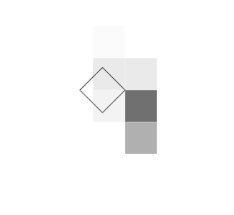 (the two white circle layers are now identical) When viewed at 50%, I get different results, though. Both screenshots have the red layer turned on. The first image has the only the first white layer on, the second has only the second white layer on. If I crop the image, the second image looks like the first again. Does this happen with OGL ON or OFF or Both? OGL settings are in the performance panel of the Photoshop Preferences. They are per image so if you turn OGL OFF please repopen the image to make it draw with OGL OFF. All of these issues happen with OGL on or off. The first two problems I posted are not display issues. I've had these problems since at least CS3 on PC and MAC. I use PS CS5 now. I've noticed guide lines look off in cs5 (same thing in illustrator too). This happens when I grab a guide line from the ruler and snap it to a selection. I would expect the line to be in the same exact location as my selection is, but it looks on one side. So I'm never sure if the placement is correct.